Have your Palawan Honeymoon, on the most beautiful, tropical islands in the world! This breathtaking honeymoon destination, also known as “the last ecological frontier of the Philippines” is home to some of the best beaches In Palawan. This is one of those places where photos don’t do it justice… It’s no wonder couples have their honeymoon on Palawan, voted the number one island in the world, now three years in a row! Have your honeymoon at one of the many luxurious Palawan resorts without it costing an arm and a leg. The best part about a Palawan Island honeymoon is the huge variety of things to do in Palawan, Philippines. Discover the newest 7th Natural Wonder of the World, the Puerto Princesa Underground River while on your Palawan islands honeymoon. From hiking through luscious jungles to snorkelling coral reefs full of tropical marine life. There is something for every couple to enjoy on their Palawan Philippines honeymoon. The Philippines differs quite a bit from the other destinations in South East Asia, as it has a big western influence. Most people speak really good English, which is why so many people come to honeymoon in Palawan Philippines. The local language Tagalog has many words very similar to Spanish. Although you don’t need to learn Tagalog, it’s definitely good to know a few basics words, as it’s a respectful thing to do on your Palawan honeymoon. Being able to communicate with the locals definitely helps to circumnavigate the vast array of islands, scattered around this breathtaking archipelago! The crowds at some many of the best beaches In Palawan aren’t nearly as hectic as other honeymoon destinations like Bali and Boracay. However, most Palawan resorts do book out during peak holiday season, so definitely book your transport and accommodation ahead of time. Your Palawan honeymoon is going to require an internal flight from Manila to Palawan. Make sure you follow our article with first hand Manila travel tips, to help you avoid scams. All of the Filipino islands are utterly gorgeous with so many adventurous things to do, like surfing in the Philippines. If you’re after some of the best Philippines honeymoon packages, you will find them on Palawan Island. There are so many all-inclusive Palawan resorts for couples wanting to relax and have a hassle-free Philippines honeymoon. So spend your Palawan honeymoon at the number one island in the world! 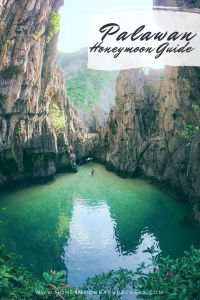 Follow our Palawan honeymoon Philippines guide for everything you need to know to make this an unforgettable trip! There are just so many incredible Palawan resorts and hotels to choose from. Finding the best hotels in Palawan can be quite a task, considering the vast choice and variety available. Some couples opt to book their Palawan beach resort through a booking site like Air BnB. If you’re new to Air BnB, use this code for $40 off your first stay! Perhaps you’d rather book your Palawan honeymoon hotels through a reputable site? You can save up to $20 off your next hotel with booking.com. So if you’re wondering what is the best resort in Palawan for honeymoon go-getters, check out our Palawan honeymoon hotel recommendations. Looking for a slice of paradise on your Palawan honeymoon? Look no further than Noa Noa Island Resort, the absolute best resort in Palawan for honeymoon go-getters. This Palawan beach resort is located an hour and a half from El Nido and is totally worth the treck here. Imagine waking up to panoramic sea views as the sun sets over the horizon, on your honeymoon in Palawan. This Palawan resorts famous for it’s snorkelling too! The reefs here are comparable to the Maldives and Carribean, with lush coral and tropical wildlife. Relax with a massage or indulge in a spa package at one of the best Palawan Philippines resorts for honeymooners! The is no wonder the Sunlight Eco Tourism Island Resort is not only the best Palawan beach resort but it’s also environmentally friendly. Spend your honeymoon in Palawan on your own private island at one of the best honeymoon destinations in the world! This luxury Palawan beach resort has all the essentials like a pool, private beach and more. If you’re wanting to luxuriate at the best resort in Palawan for honeymoon travelling couples, look no further than here! The Pangulasian Island is by far the most incredible Palawan beach resort! This Palawan honeymoon resort is also eco-friendly, with a plastic-free approach and conservation effort to preserve the wildlife. There’s no better feeling than knowing that you’re helping the longevity of the environment while also enjoying your Palawan honeymoon. If you’re wanting to stay at a luxury Palawan beach resort, you will love Pangulasian Island! Stay at Sunset Beach Resort, one of the best resorts in Palawan that is also pretty affordable. If you’re wanting a luxury Palawan honeymoon at a reasonable price, then this place if perfect for you. This Palawan resorts ran by a sweet husband and wife duo, who go above and beyond to make your stay perfect! Have the best time at this incredible Palawan beach resort and enjoy the magical sunrises and sunsets! If you’re wondering what are the best places to stay in Palawan Philippines, then wonder no more. The Paolyn Floating House is not only one of the best place to stay in the Philippines, it’s also an incredible Palawan honeymoon destination. Located in the middle of the ocean surrounded by breathtaking islands, is this Palawan honeymoon hotel. Enjoy tropical lagoon views from the boathouse while having breakfast. Spend the day snorkelling the coral reefs, kayaking through lagoons, swimming, paddle boarding and paddle boating around the Palawan archipelago. This is one of the best places to stay in Palawan Philippines, especially if you’re looking for the ‘wow’ factor in a honeymoon! Spend your Palawan honeymoon at Muntin Paraiso, one of the best Palawan hotels for honeymoon. This tranquil oasis boasts an incredible pool, with bungalows dotted around the property that are all very private. Relax in a hammock or enjoy happy hour cocktails at the bar. This is one of the best places to stay in Palawan Philippines, for honeymooning couples in Puerto Princesa. The Jungle Hut is the perfect balance of romantic and rustic. Located off the beaten path, with both jungle and beach views is this charming budget Palawan hotel. Couples seeking those chilled out vibes on their Palawan honeymoon will love it here, especially if you enjoy tasty food! The price is cheap, the facilities are basic but the vibe is on point. If you’re looking for a peaceful place to stay in Palawan that’s cheap, close to the beach and relaxing, then this is your Palawan paradise! Stay in the Seaview room at the Dakila Cabins in Palawan, which boasts the most incredible view! This rustic, tropical oasis is perfect for couples wanting to relax on their Palawan honeymoon. Enjoy the delicious meals prepared fresh to order, indulge in a couples massage and just enjoy the spectacular view! If you’re wondering where to stay in Palawan that’s budget-friendly and off the beaten path, then wonder no more. The Dakila Cabins are by far one of the best places to stay in El Nido Palawan, for couples wanting to escape the tourist scene in El Nido. If you’re having a Palawan honeymoon, chances are you’re flying into Puerto Princesa. Make the most of your time in Puerto Princessa by exploring the city and surrounding attractions like Honda Bay. It is no surprise that the main attraction here is the Puerto Princesa Underground River, so make sure you check that out too! Uber is also quite popular and cheap in Puerto Princesa and is a great alternative to taxi’s, especially if you do not have Philippine pesos when you arrive. We’re giving you $5 USD off each of your first 4 Uber rides, just click here to save $20 USD! An even better option than Uber is Grab! It’s cheaper than Uber and there are more drivers. We love using Grab on our Palawan honeymoon as you can’t get ripped off and don’t have to pay with cash (unless you want to). Here’s up to 170 PHP off your first ride with Grab or use our referral code ‘GRABHBACKPACKERS’. The boat trip from Sabang to the national park is simply incredible, and a very romantic experience for you and your lover on your Palawan honeymoon. You’re surrounded by crystal clear ocean and pass by many stunning rock formations on your way to the national park. 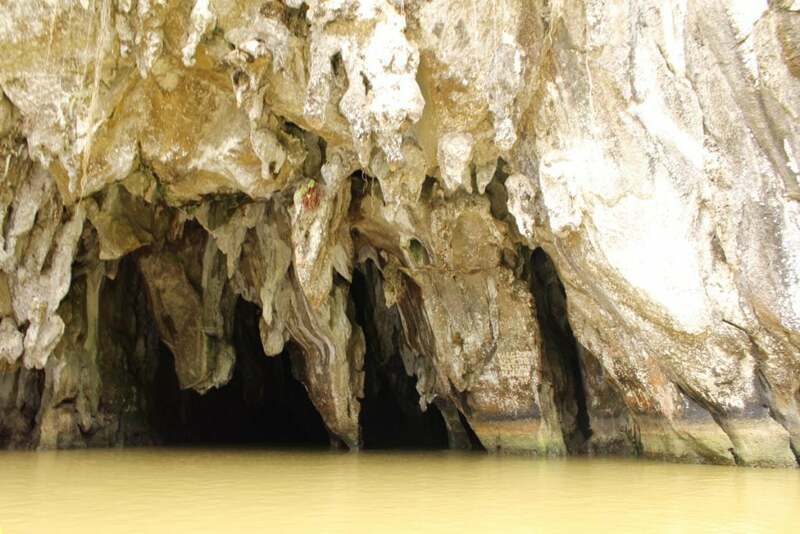 The entrance to the Puerto Princesa Subterranean River National Park is framed by limestone-jagged cliffs and you can hear the sounds of native wildlife. Access to the river is at the mouth of the cave and is framed by ancient trees growing right to the water’s edge. The Underground River travels 8.2km deep underground, through the surrounding mountains that you see on your drive into Sabang. The river opens up into several massive underground caves, with the most intricate limestone stalactites & stalagmites we’ve ever encountered. One large chamber known as the ‘Cathedral’ is over 60m high and has many cool formations inside like the incredible angel formation mounted on the wall. Try to get the front seat of the tour boat, if you’d like the best view. You are given a headset with an auditory explanation throughout the tour, which is super useful and informative. At 1.5km inside you hit the twilight zone, where there are tons of bats and other creatures who have never ever been exposed to sunlight. The biodiversity inside the Underground River dates back 1000’s of years and has many species that have evolved over the years. We shone our torch on a crab, which had the thinnest transparent shell, you could literally see the inside of its body. The photo’s don’t do it justice at all, you need to see it in its full natural state to grasp how incredible the Puerto Princesa Underground River truly is! Try to get an early tour of the Puerto Princesa Underground River on your Palawan honeymoon in the Philippines. Wait times can exceed up to two hours in peak times! We were lucky and only had to wait 15minutes, however, some of our friends weren’t as lucky and waited well over an hour! If you’re heading near the public bus terminal and have half an hour free, then you definitely need to check out the night market on your Palawan Honeymoon! They have literally anything and everything imaginable from clothes to shoes, fresh seafood and meats, even some delicious street food. It’s a really authentic experience that most honeymooners overlook when they come for their Palawan honeymoon in the Philippines. We found the meat section pretty overwhelming… but we’ll give the Filipino’s one thing, they’re really economical and don’t waste any part of the animal. The whole vibe of the market was cool, everyone is so intrigued as to why you’re here and is excited when you’re keen to try their street food. Just make sure you know what you’re ordering because there’s a lot of weird meat… After seeing the meat section I was pretty keen to have something vegetarian. It looked like they had some wicked grilled capsicum on the BBQ, so I asked if it was and the lady said yes. Unfortunately, I didn’t see her son laughing hysterically behind her and opted to get my delicious grilled vegetable. Turns out it wasn’t capsicum at all… it was, in fact, pig skin! Just stick to the standard fried lumpia’s (spring rolls) and you will be fine. Visiting the Puerto Princesa Night Markets on your Palawan honeymoon is such an off the beaten path honeymoon experience. You don’t have to venture far to enjoy pristine beaches & exotic marine life. Spend the day island hopping with your lover on your Palawan honeymoon. Visit places like Luli Island, Starfish Island and Cowrie Island in Honda Bay Palawan. This awesome tour picks you up from your hotel in Puerto Princesa and takes you to the best places in Honda Bay, where you can go snorkelling. Couples looking for a fun day island hopping on their Palawan Honeymoon will love this tour, which includes a delicious buffet lunch. Iwahig Prison and Penal Farm is a wicked off the beaten path experience, located about 45 minutes from the city. It’s a really interesting off the beaten path honeymoon experience that you won’t get anywhere else in the world. You can literally go to the prison and chat with the inmates who are in jail on your Palawan honeymoon in the Philippines. Kind of crazy, but also kind of cool! The trike ride was 800p for a round trip, or you can just rent a motorbike and cruise there on your own. Make sure you’re fully covered up, this means your legs and shoulders need to be covered. It’s free to get into the Prison, but you should bring along a gift e.g. cigarettes or money. We’d recommend gifting something that can easily be shared among the inmates. The best part about your honeymoon in Palawan is the affordable cost of accommodation! Stay at Villa Calachuchi for your Palawan honeymoon, the bungalows are set in pristine gardens with a small pool. It’s luxury honeymoon accommodation at a budget price point and it’s located close to the airport. To save on accommodation costs on your Philippines honeymoon in Palawan, use this link for $20 AUD off your next hotel with booking.com. Airbnb is also quite popular in Puerto Princesa, and you can find some awesome apartments and houses for your Palawan honeymoon at super affordable prices. Follow this link for $35 free credit. Who wouldn’t want to swim in water like this! If you’re looking to relax by the beach away from the crowds on your Palawan honeymoon, Port Barton is the place to go. 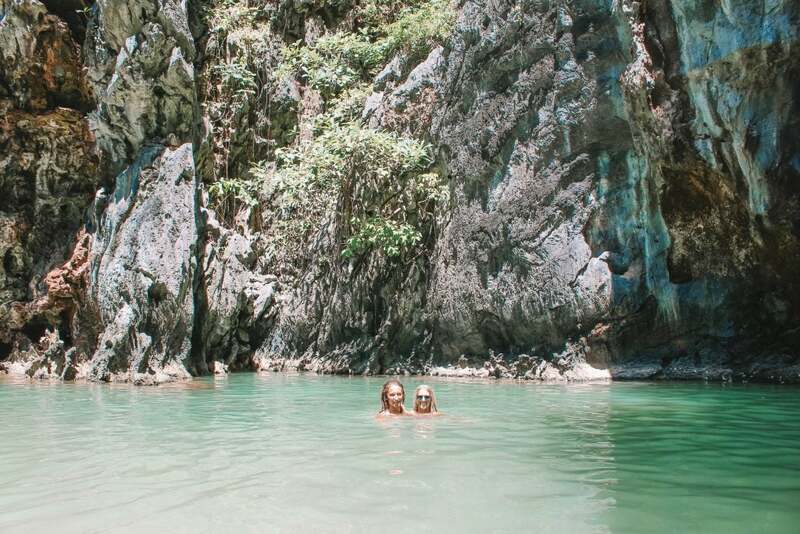 It’s a great Palawan honeymoon destination that’s off the beaten path… literally. It’s off an unfinished dirt road that has construction going on around you. Perhaps the road has since been finished, nevertheless, it’s a great Palawan honeymoon hotspot that isn’t packed with tourists. The drive to Port Barton is incredible as it goes through some of the most untouched and underdeveloped parts of Palawan. We saw people bathing and washing their clothes in the river, farmers riding water buffalo and animals roaming around. Port Barton is a little-untouched slice of paradise which is ideal for newlyweds who’re having a romantic Palawan honeymoon in the Philippines. Relax by the beach, indulge in a couples massage just relax and unwind after all the stress of the wedding. Palawan honeymoon destination, Port Barton is a very simple town, with dirt roads and no taxi’s, so you have to walk to get around. The beach in Port Barton is far nicer than El Nido and is really secluded for couples wanting their own privacy. There’s a limited supply of electricity to Port Barton. Therefore the town is prone to blackouts. There is no ATM in Port Barton, so be sure to get cash out before you arrive! If you’re strapped for cash, you do have the option to wire transfer some money. Try not to hurt yourself, as they have no hospital in Port Barton. WiFi comes and goes in Port Barton, so try to live in the moment and not on your phone! Island Hopping is the main attraction here in Port Barton, which is great for couples on their Palawan honeymoon. If you’re on budget honeymoon in Palawan, Port Barton is perfect as they offer island hopping for only 800 Php, opposed to 1,200 and upwards in El Nido Palawan. The price includes lunch and snorkelling, but be wary of people attempting to make you pay an ‘environmental fee’ on some of the islands as it’s already included in your ticket. Rent a motorbike for the day (400 Php) to find Pamuayan Waterfall on your Palawan honeymoon. Otherwise, you can walk through the jungle to Pamuayan Waterfall. We opted to walk to the waterfall by taking the trail next to Green View Hotel. It takes about 1.5 hours but, it’s amazing as you’re surrounded by nothing but nature, animals and little huts on the side of the road. The waterfall is spectacular, especially on a stinking hot day in the Philippines. You can climb up the side of the waterfall and jump off into the depths below, just be careful because the rocks are super slippery! We got a lift back to town on the back of a motorbike with a local for only 100 Php once it started to rain on us! This is one of the best things to do in Palawan for couples on their Philippines honeymoon! You can get to honeymoon destination Port Barton by either land or sea on your Palawan honeymoon. We’d recommend land for couples who’re on a budget honeymoon in the Philippines as it’s slightly cheaper. This costs 800 Php per person book online with 12Go Asia! 500 Php per person, book your ticket online here! There’s an abundance of accommodation options for your Palawan honeymoon in Port Barton. Perhaps you’re after a romantic honeymoon experience? You could look at staying at the famous Thelma & Toby’s Island Beach Camp. It’s located 20 minutes by boat from the beach and offers five-star island camping. It’s a great Port Barton honeymoon package that’s affordable, setting you back 1,600 Php per night and includes all meals. 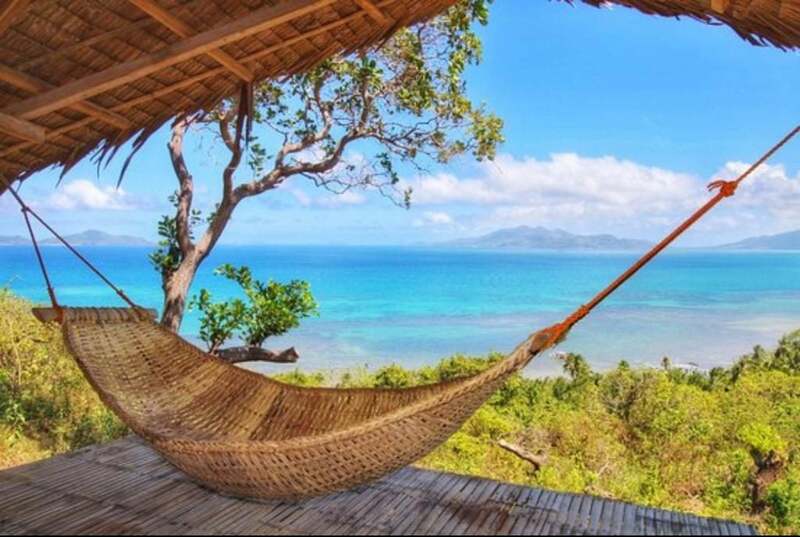 If you’d like your own private abode, check out AirBnB in Port Barton for your Palawan honeymoon. Use this code for $35 off your stay! El Nido is a popular Palawan honeymoon destination, for beach-loving couples. The charming town El Nido, Palawan is surrounded by stunning gorges and cliffs. The sun even sets behind the cliffs of El Nido, turning the whole sky pink as it soon fades to darkness. The main beach of El Nido is nice-ish… It has potential if it wasn’t for the million boats docked on the shore. However, there are so many beautiful beaches nearby like, Marimegmeg and Nacpan Beach. Regardless, the view from the beach is incredible, it has a beautiful outlook over the ocean and limestone rocks elevating from the water. If you’re looking for an El Nido honeymoon package, perhaps try staying at an all-inclusive resort like The Nest El Nido Beach Resort! Before you head to El Nido remember to visit an ATM beforehand. There’s only one in town and it runs out of cash on a regular basis. Trust us, we found out the hard way… We got stitched up paying a 6% fee on top of our regular bank card fees, just getting cash out from the local gas station. It’s always worthwhile keeping spare cash when you’re on your El Nido honeymoon. You will need to purchase an environmental permit for your El Nido honeymoon. Most tours do not include the 200 Php environmental fee in the price, however, the permit does last for ten days. The environmental fee funds environment and tourism-related projects. 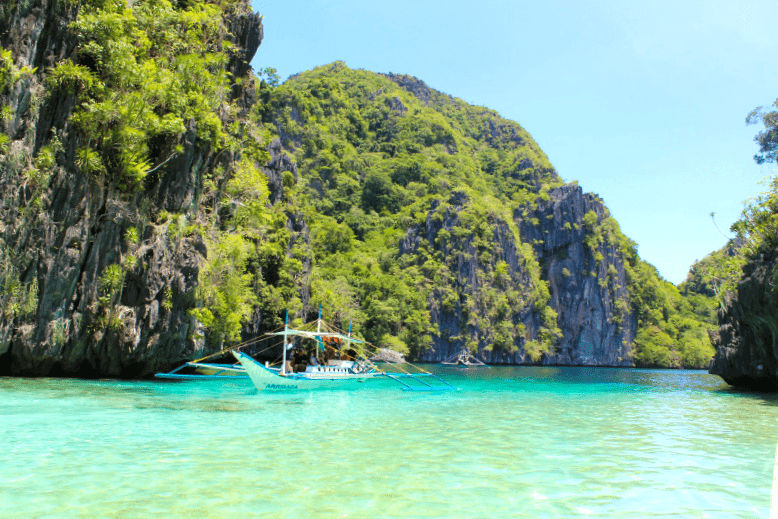 El Nido Palawan is one of the best Palawan honeymoon hotspots, so it’s quite easy to get here. There’s an abundance of buses, boats and minivans heading to and from El Nido Palawan. If you’re looking for the cheapest way to get from El Nido to Puerto Princesa, take a Cherry bus. Your other option is a minivan, this will either drop you in town or to the Palawan Philippines airport in Puerto Princessa. Take a minivan from El Nido to Port Barton and vice versa. Ferry leaves at 6 am from the pier in El Nido along the Montenegro line to Coron! Pre-book your El Nido to Coron ferry as it tends to be fully booked during peak season. The most romantic El Nido honeymoon package includes an island hopping tour! There are four different El Nido island hopping tours you can choose from, however, tour A and C are by far the best. Island hopping tours in El Nido range in price and also includes lunch. Honeymoon on the beach at the secret lagoon in El Nido, however, it isn’t much of a secret anymore…The romantic honeymoon island hopping tour also stops at the big and small lagoon where you can swim, snorkel and kayak around. We saw turtles, clown fish, parrot fish and tons of other tropical sea life while snorkelling in El Nido. Lunch is caught, cooked and served from the boat and consists of an array of seafood, vegetables, rice and fresh fruit. Our last stops were Shimizu Island and 7 Commando Beach where we swam in the sea, sunbathed and sipped on fresh coconuts. Everyone on the tour was slightly intoxicated and all friends by the end of it. We had a great day getting day drunk, frolicking in the sea and island hopping around El Nido on our Palawan honeymoon! If camping on a secluded island is on your honeymoon bucket list, then this is the tour for you! We had an incredible time camping on a private island with no power, WiFi and an unlimited supply of rum. The tour includes a little bit of island hopping, all your meals and drinks/alcohol for only 1,800 Php per person. It’s a great deal for newlyweds who’re on a budget honeymoon in the Philippines, as it includes everything you need and saves you money on a nights accommodation. Check with the local El Nido Palawan hotels & hostels to see when the tours are running. El Nido Palawan is famous for its incredible scuba diving and snorkelling. 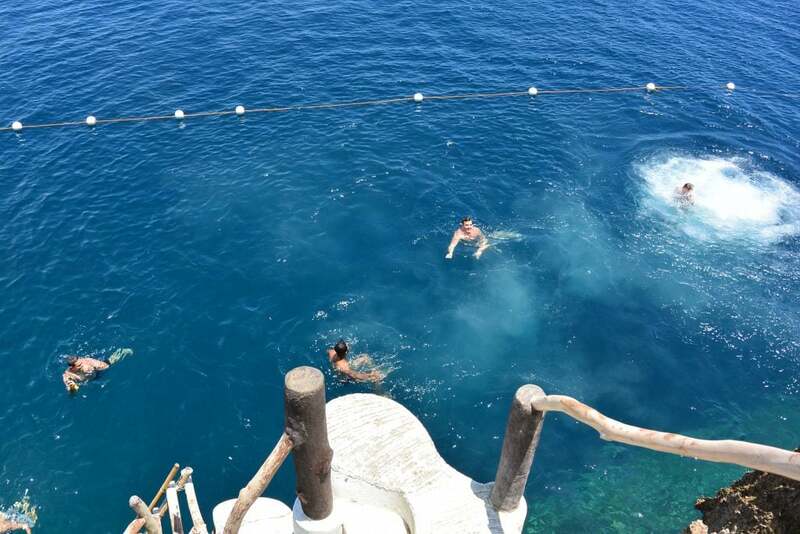 There are so many incredible diving spots to choose like Nat-Nat, Twin Rocks, Tagbao Island and the diving wall. If you’re not much of a diver and don’t plan on getting scuba certified on your El Nido honeymoon, give snorkelling a go. The best part about snorkelling in El Nido is that majority of reefs in El Nido are fairly shallow, so you don’t need an oxygen tank to see beautiful marine life like turtles, stingrays and tropical fish. We can recommend the snorkelling at Caldo Island with this awesome island hopping and kayaking tour! There are a few cool lookouts and beaches surrounding El Nido that you should explore on your Palawan honeymoon! You can rent a motorbike for 500 Php for the day or hire a trike driver instead. 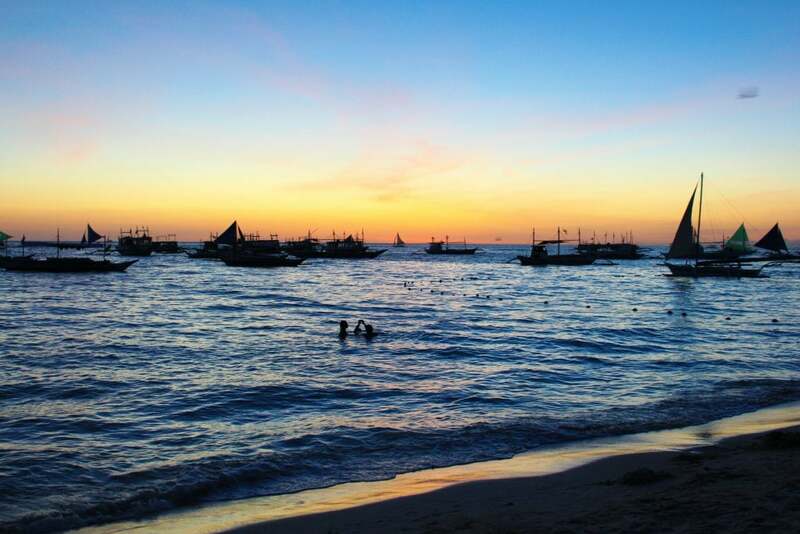 Watch the sunset from Merimegmeg beach, also known as sunset beach, there are great happy hours here. Spend the day at Las Cababanas beach, swimming in the sea and baking in the sun. Go for a hike to Taraw Peak and take in the incredible bird’s eye view of Bacuit Bay. No matter what beach or lookout you find, it’ll be a great adventure on your El Nido honeymoon, just make sure you have Maps.Me downloaded to navigate your way around. Hike through the lush jungle with your lover on your romantic El Nido honeymoon in the Philippines. It’s about a 1-2 hour hike to the Nagkalit-Kalit waterfalls. There is one 10m waterfall and two others with pools beneath them to swim in. Or, opt for the full day El Nido beach and waterfall inland tour. It’s one of the best El Nido Palawan things to do for couples who want to explore but aren’t confident on a scooter or motorbike. The best El Nido Palawan Honeymoon Package includes everything from food to accommodation and transport costs. Stay at The Nest or Panorama resort, they’re among the best El Nido Palawan hotels! If you’re after one of the more luxurious El Nido Palawan Hotels, check out the Coco Resort in El Nido. There are just so many incredible El Nido Palawan hotels to choose from. The hard part is, choosing what Hotels in El Nido Palawan to stay at! To save on accommodation on your Palawan honeymoon, use this link for $20 AUD off your next hotel with booking.com. Airbnb is also quite popular in El Nido, you can find some really incredible romantic honeymoon hotels at really affordable prices. Follow this link for $35 free credit with Airbnb. Honeymoon in Coron Palawan, your dreamy Philippines honeymoon destination. Coron is famous for its incredible coral reefs and wreck diving with limestone formations framing the island. Your Palawan honeymoon package isn’t complete without diving, hiking and exploring the island of Coron. Coron looks like one of those honeymoon destinations you’d see in a magazine, but it’s actually a very affordable honeymoon destination in the Philippines. Your Coron honeymoon package is far more budget-friendly than neighbouring destination El Nido, with much more budget accommodation options available. Island hopping is also a little cheaper on your Palawan honeymoon, with tours starting from just 700 Php. Fly to Coron from major Philippines airports like Puerto Princesa and Manila. Fares start from $80 USD per person. To get from Busuanga airport to Coron Town catch a shuttle bus. It will set you back 150 Php per person and the journey takes about half an hour, depending on how many people they have to drop off before you. Spend your Palawan honeymoon on Coron, island hopping and taking in the beautiful surroundings. There’s a ton of island hopping tours that take you to islands like Calamian, Diwaran and Sangatisla. The island of Coron is such a beautiful beach honeymoon destination that’s filled with exotic sites like Barracuda lake, where you can go cliff jumping, free solo climbing and kayaking. Discover secret lagoons like Coron’s hidden and twin lagoons with crystal clear water and incredible limestone formations. Make sure you visit twin lagoon Coron Palawan while you’re here, it’s one of the best things to do in Coron! Coron is famous for its incredible dive spots with many wrecks and immaculate coral reefs around the island. Why not have an adventurous honeymoon and scuba dive WW2 wrecks like the Okikawa Mary japan oil ship that sits 26m below the surface. Perhaps scuba diving isn’t your thing, so maybe snorkelling is? 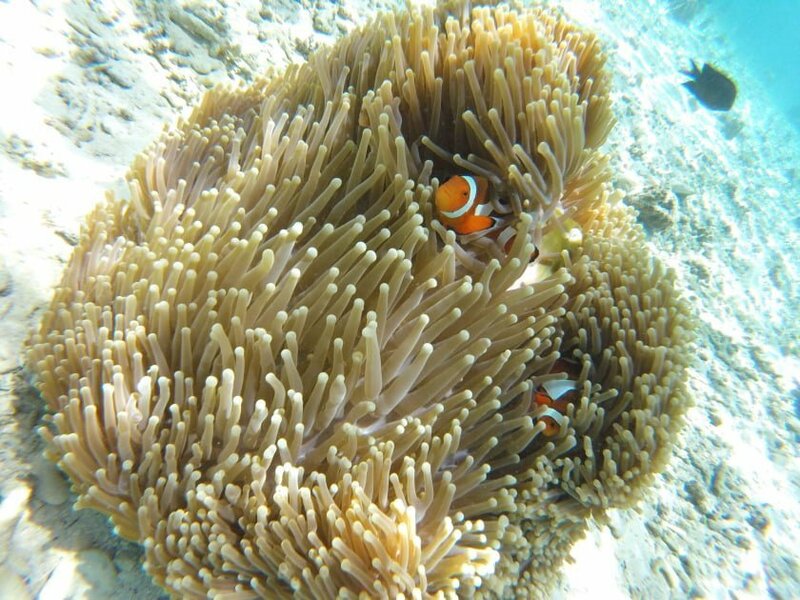 There are some killer snorkelling spots and reefs around the honeymoon destination Coron. Visit the Iusong coral garden, Siete Picados and Kayangan for the best snorkelling spots in Coron. If you’re looking for some of the best things to do in Palawan, Coron, definitely check out the Culion Island Tour or the Wreck and beach tour. Get outdoors and discover some of the most breathtaking viewpoints on your Coron/ Palawan honeymoon in the Philippines. The hike up the stairs to Mt Tapyas will help with those booty gains, we’d recommend doing this in the morning before it gets too hot. 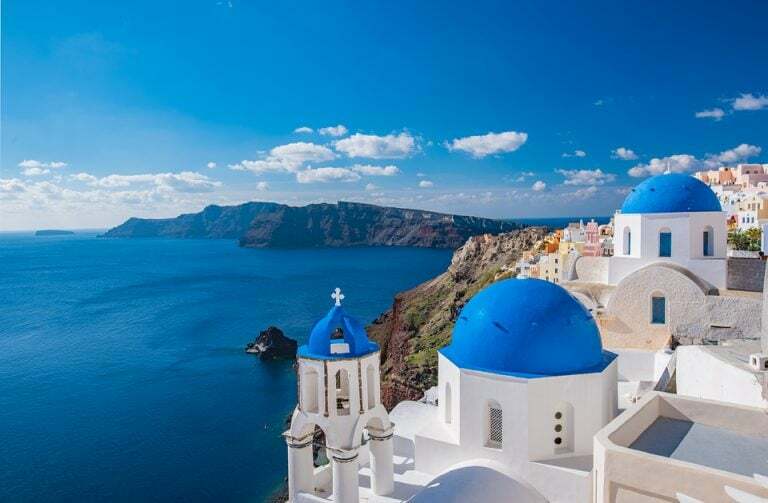 The Mt Tapyas viewpoint is incredible, boasting panoramic views of the island! It’s a great spot for couples honeymoon pictures (if you’re not too hot and sweaty). Outdoorsy kind of people love taking on Mount Tundalara Peak while honeymooning in Coron. The summit is also known as Dalara (meaning maiden), is the second highest peak in Palawan, sitting 640m above sea level. It’s an incredible vantage point with epic views of the island, especially at sunset. Who wouldn’t want to chase waterfalls on their Coron honeymoon in the Philippines? Go on an adventure with your partner and find the incredible Conception Falls in Coron. You may have to do some semi-rock manoeuvring to get to the falls, but it’s all part of the adventure! The water is so refreshing on a hot day and hardly any tourists know about this secret hidden gem of Coron. 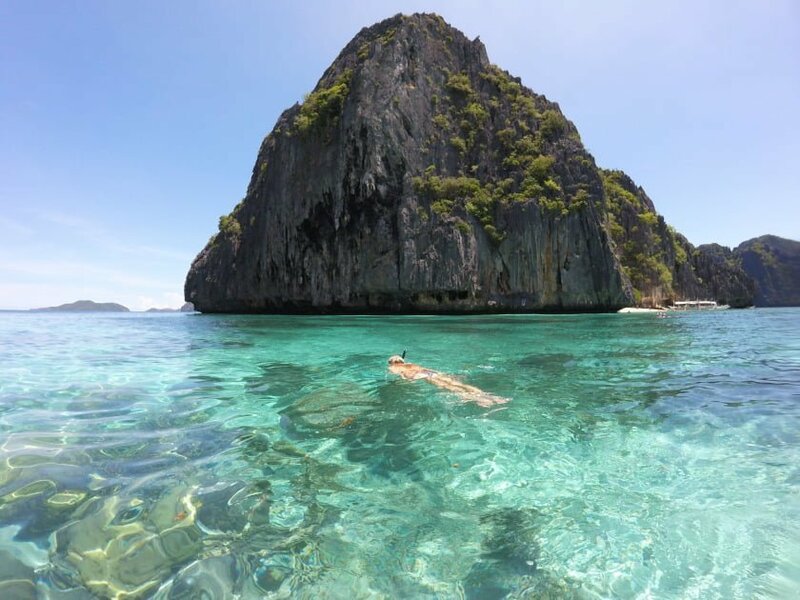 It’s a really romantic, off the beaten path spot to visit on your Palawan Honeymoon. Is a honeymoon in the Philippines really complete without relaxing on the beach in Coron? Soak up some sun, swim in the sea and relax following your stressful post-wedding bliss. Atwayan Beach is breathtaking, with white sand and crystal clear water. It’s better known as sunset beach as it boats a spectacular view at sunset. There are so many beaches to discover in Coron like Calachuchi, Dicanituan and Hidden Beach. The most romantic beach in Coron in Banul Beach, pack a picnic and spend the day here with your husband or wife on your Palawan honeymoon! There are so many romantic Coron Palawan hotels for you and your lover on your Palawan honeymoon. If you’re on a budget honeymoon and want to stay in the jungle, check out La Natura Resort! This is one of the best resort in Coron, Palawan, as it’s great value for money and super romantic. Perhaps you’re after complete luxury at the best hotel in Coron, Palawan? Definitely check out the Two Seasons Coron Bayside Hotel on your Palawan honeymoon. No matter what Coron Palawan hotels, you and your lover choose, it’ll make for an amazing Palawan honeymoon! To save on accommodation on your Palawan honeymoon, use this link for $20 AUD off your next hotel with booking.com. Airbnb is huge and all over the island of Coron, you can find some really incredible romantic spots at really affordable prices. Follow this link for $35 free credit with Airbnb. Majority of nationalities are able to obtain a free 30day visa upon arrival into the Philippines. Check to see your countries visa requirements. Thirty days is great for those wanting a short holiday, however, it wasn’t nearly enough time for our Palawan honeymoon. If you plan to stay longer than a month, definitely look into getting a 59-day tourist visa. You can obtain this directly from the embassy or online. If you don’t have time to organise this in advance, you can also extend your visa waiver from the immigration office in the Philippines. 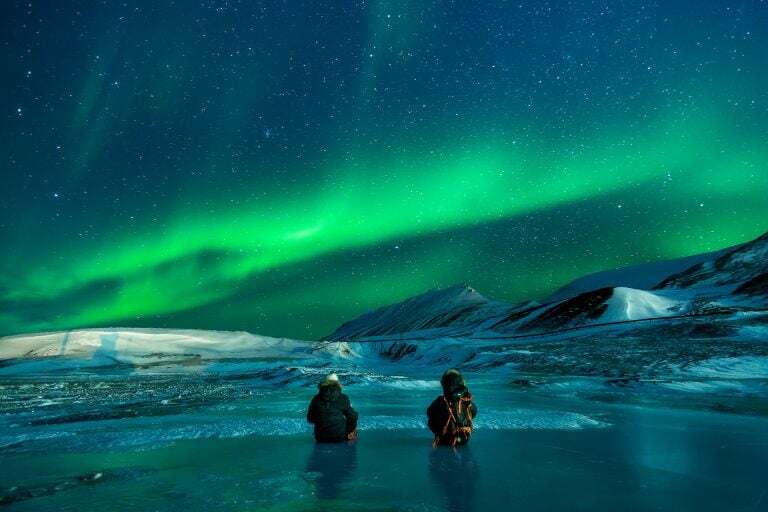 You’d rather not think about all of the things that might go wrong on your romantic getaways in Alaska, but these things can and do happen. We like to think of travel insurance as a safety net, as it’s saved our butts big time on more than one occasion. We had our bags stolen, with passports, cameras and a decent chunk of money, and thanks to travel insurance we were able to replace these valuable items. I fell ill on our honeymoon and had to spend a week in the hospital, which racked up a huge debt. Without travel insurance, we would have been in thousands of dollars of debt. It’s not worth the risk to travel without insurance! Keep your mind of ease on your Alaska honeymoon by travelling smarter and safer with World Nomads travel insurance. These guys are the best in the business with affordable coverage for you and your lover on your Alaska honeymoon travels. All opinions remain the writer’s own. The content of this website is subject to copyright. For more information, please refer to our copyright & disclosure policy. Here at Honeymoon Backpackers, we honour transparency! Included are some affiliate links within this article, so if you book anything through our links we will earn a tiny commission at no extra cost to you. We strive to give our readers the best recommendations. Your support helps keep our site running, so help us help you!